100% cotton thermal underwear has been around since cotton was first used to make garments. Cotton is readily available almost anywhere in the world and since cotton is used to manufacturer so many different types of clothing it is produced in such large volume that it has kept the price low on cotton thread. One of the first benefits you get from 100% cotton thermal underwear is that it is arguably the softest natural fiber you’ll ever wear. You wear thermal underwear to stay warm, but you also wear it to be comfortable and 100% cotton has always added to that comfort. Until polyester was invented, 100% cotton thermal underwear was really about all you could find. The next benefit that you get with 100% cotton thermal underwear I already mentioned. It is a natural fiber. It is not man made so it doesn’t contain chemicals that many are allergic to. Cotton is also warm. Cotton is not the warmest fiber out there by far, but when the thread is weaved into the right pattern, such as a waffle knit, it insulates well and will keep you very warm. Lastly, cotton does not melt if exposed to heat, spark or fire. This property of 100% cotton is critical for someone who will be wearing it while working under flash hazard conditions. If the wearer was suddenly exposed to heat, spark or a flash fire, the cotton would not melt into their skin like a synthetic fiber would. For this reason, you’ll see 100% cotton used by fire fighters, aircraft pilots, electricians, oil workers, welders, etc. The one major drawback to 100% cotton thermal underwear is that it absorbs water really well. This is not a big deal if you won’t be very active while wearing 100% cotton thermals. But it is a big deal if you will be exerting yourself to the point of sweating. When you begin to sweat, 100% cotton quickly absorbs the sweat from your body. Cotton doesn’t dry quickly so the moisture just stays in the fabric. This feature causes a number of problems. The most concerning problem caused by 100% cotton thermals ability to absorb and retain moisture is that it can quickly cause hypothermia. Your body produces sweat while you are exercising in order to cool your body and keep it at a normal temperature. Cotton thermals keep that sweat against your skin instead of allowing it to dissipate. Even after you stop sweating, the moisture held against your body by the cotton thermals continues to cool your body well after your body stopped sweating. Prolonged exposure to these conditions, even in moderately cold temperatures will likely cause hypothermia. 100% cotton thermal underwear also shrinks more than any other thermal. Cotton naturally shrinks when exposed to water and heat. 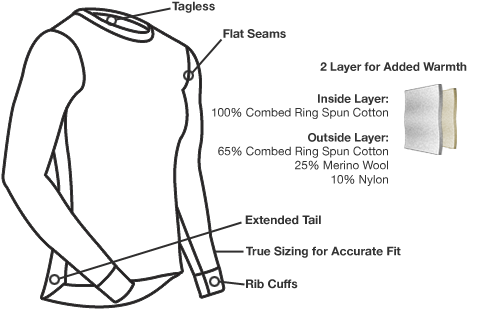 Many manufactures of 100% cotton thermals will preshrink their product, but even with preshrinking it will still shrink after a number of launderings. When considering whether or not to wear 100% cotton thermal underwear, it is best to keep the things I just discussed in mind along with what you will be wearing the winter thermals for. If you will not be very active and you love the soft feel of cotton, then they are probably the right choice for you. If you know that you’ll be active or exposed to moisture, then you’ll probably want to stay away from 100% cotton thermal underwear and steer more towards something that is synthetic like polyester or polypropylene. Are you familiar with the brand Coldpruf? Coldpruf is a fitting name for a new line from one of America’s oldest and largest thermal underwear producers. Indera Mills thermal underwear company was founded in1914. Some of their first primary products were thermal slips, vests, and thermal union suits. Indera’s focus has always been cotton and cotton blend thermal under garments so they have spent almost 100 years reducing costs and perfecting their high quality products. However, all of Indera Mills products were for general use and not necessarily for specialty outdoor markets. 3 years ago, at the suggestion of one of their major retailers, Indera introduced a new line of premium brand thermal underwear designed for the competitive outdoor industry. Indera appropriately named this new line Coldpruf after the products ability to keep your body’s natural warmth in and the cold out. The highlight of Coldpruf’s new line of thermal underwear is it’s Coldpruf Authentic merino wool blend thermal underwear. What sets Coldpruf apart from the rest of Indera Mills product is it’s extra soft hand. Hand refers to the feel of the garments fabric. The thread for Coldpruf’s thermal underwear is knit extra small so that it is more fine making it softer to the touch. The Authentic merino wool thermals utilize high quality merino wool thermal fabric for superior insulation effectively trapping your body’s heat next to your skin. All of the Coldpruf line feature flat lock seams, a signature quality of high end garments. Flat lock seams are seams that are sewn down so that you can’t feel the seam. 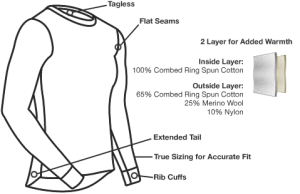 This makes Coldpruf thermals ideal for wearing underneath ski or snowboard clothing because the seams in your thermals won’t cause pressure points underneath your outer winter clothing. With all this talk of how well Coldpruf merino wool thermals perform for outdoor activities, it is important to realize that all of the qualities that make them perfect for the outdoors also makes them perfect for indoor use. If you sit in an office and freeze all through the winter and the waffle knit thermals you are familiar with are not very comfortable then Coldpruf is for you. In just a few short seasons since its’ release, Coldpruf has quickly made a name for itself as a first choice for comfortable merino wool thermal underwear. With merino wool being the new buzz word in outdoor apparel, most major brands are coming out with their own line of merino wool apparel. The most popular use for merino wool is for socks and for thermal underwear. A quick search on the search engines will lead you to many different sites with many different selections of merino wool thermal underwear. If you hate being cold and you are looking for the warmest merino wool base layer available, you’ll want to search for expedition weight merino wool. Expedition weight merino wool is the thickest available. The thicker the garment the more air it is able to trap inside providing more insulation for your body’s natural heating system. As I mentioned already, there are a lot of different brands out there producing merino wool thermal underwear. But there is only one that I know of that makes merino wool garments in an expedition weight and it is from a brand called Minus 33. With a name like Minus 33, you know they make warm stuff and you can guarantee that their expedition weight merino wool thermals are as warm as you can get. Minus 33 has been making expedition weight wool garments since they were founded in 1916, but only recently began making them from 100% merino wool. Right now they are only available in black which is probably the second most popular color for thermal underwear second to white. They do have other lighter weight merino wool thermal underwear and products available a wider selection of colors. I would guess that in the future Minus 33 will expand their color selection to their expedition weight merino wool lines. Oh, and I forgot to mention that Minus 33 does make their expedition weight merino wool in both mens and womens sizes. So, if you want the warmest merino wool thermals available, then go with the Minus 33 expedition weight merino wool thermal underwear. I guarantee you’ll love not only the warmth but also the quality of the product.